In Chinese symbols it is The Ox who represents incredible physical, mental and emotional strength and stamina! Their accomplishments are the result of sheer determination. This zodiac sign simply will not quit once they’ve put their mind to something. No small wonder that the People’s Republic of China was established in 1949 (the Year of the Ox). 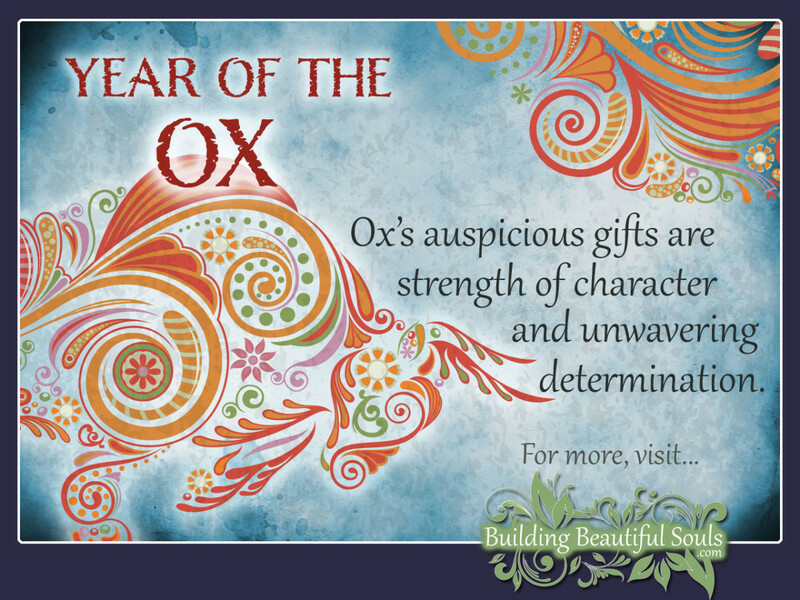 Those born in the Year of the Ox are calm and methodical. The Chinese Ox is traditional & fairly conservative. Even if their forward progress is in tiny increments to the Chinese Ox it still means forward movement and that’s OK with them. Independent almost to a fault, the Chinese Ox is revered for their high moral character. Whatever they build (families, businesses, homes, etc. ), it is built to last forever. Words are used sparingly by the Ox but they mean what they say and they say what they mean. Of the Chinese animals, it is The Ox which is renown for their extraordinary memory. It is photographic and lasts forever. Whether man or woman, the Chinese Ox rules their household with the proverbial iron fist and, so, can be intolerant. Stubborn in the extreme the Ox can also be very biased. Because they abhor weakness of any kind, the Ox can, at its most negative, be totally devoid of compassion. Further, they are slow to anger but when an Ox blows, run! If wounded in any kind of relationship, the Ox can fall into a deep depression that can last for many years. Just as in Western Astrology, no person is defined solely by their primary Zodiac or Sun Sign. In Chinese Astrology, each of the New Year’s animals’ personality traits and characteristics are colored by 2 of the 5 elements. Each of the 12 Chinese Zodiac Animals has an ascribed fixed element which affects their basic personality. In addition, the element belonging to one’s birth year is a secondary influence on who they are, can and will be, life’s purpose, career path, etc. Scroll down to find your birth year. This will tell you which “type” of Chinese Ox you are and help you to learn more about how the combined energies of the fixed and secondary element impact your life. Those born in The Year of the Water Ox is the most flexible of all the Chinese Oxen (which doesn’t say a whole lot, but still…). Though they are just as determined as the other Ox personalities, they do play and work well with others and are not as prone to tunnel vision. Even though the Chinese Ox tends by nature to be childlike in their natural trust of people, the Water Ox has the ability to be more shrewd than his/her brethren. Learn all about the symbolism and meaning of the water element. The Fire Ox is just that, fiery. Those born in The Year of the Fire Ox are fueled by an overwhelming desire for power and control. Everything the Ox thinks, says and does is based on belief that they are superior beings in every way. Even though they are honest as the day is long and, oddly enough fair-minded, the Fire Ox is inconsiderate. Whereas the other Chinese Ox personalities are slow to speak and use few words, the Fire Ox is outspoken. Learn all about the symbolism and meaning of the fire element. The Metal Ox is, perhaps, the strongest willed of all the Chinese Ox personalities. Obsessive about getting what they want, extreme aggression rises anytime they even perceive a hint of possible failure. Those born in The Year of the Metal Ox will work day and night to achieve their goals and are among the most reliable and responsible of the Chinese zodiac signs. The Wood Ox is the most open minded of the Chinese Oxen. Social nuances and traditions are within their understanding and, so, the Wood Ox is very capable of achieving extraordinary wealth because they see the interconnected and necessary nature of teamwork and community. Those born in the Year of the Wood Ox are the more cheerful and outgoing of The Chinese Oxen. The Earth Ox is the very definition of “salt of the Earth”. Slow and steady wins but they are not in a race. Stoic and unwavering once this Chinese Ox personality focuses on something they want they will not waiver and they will not give up one ounce of ground gained. In fact, those born in The Year of the Earth Ox are willing to suffer extreme circumstances without complaint one while on the journey to achieving their goals. Learn all about the symbolism and meaning of the earth element. Do not expect the Chinese Ox to sweep you off your feet. Both the male and female Ox can be naive and a bit clumsy when it comes to romantic love. Though they can be frustratingly slow to open up and show their true feelings, and while their practical natures can make a romance with them less than steamy, once a Chinese Ox decides you’re “the one”, you can count on them to live and die for you forever. For best zodiac compatibility, The Ox’s best options are The Chinese Rooster and The Chinese Snake. Where other youngsters can be chatty, Chinese Ox children speak late in their developmental process. They use the physical to express themselves. Intensely private they are not generally given to bursts of emotion (of any kind) and are a fairly serious lot. Smart in a practical way, Ox children can be naive when it comes to the duplicity of mankind and, so, can need extra protection by elders. Finally, Ox children need discipline and routine to make them feel safe and safety is something the Chinese Ox seeks its whole life long.